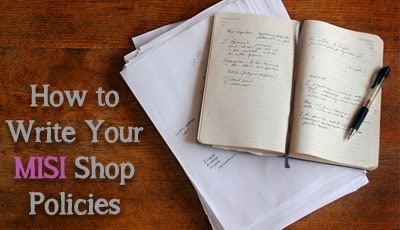 One of the most important things you have to do in your MISI Shop is to fill out Shop Policies. Help the store owner stay consistent and have actions in place for certain situations. Raise your sales. Stores with no policies have fewer sales. Tell your buyers what you will do in the event of non-payment. Describe how your items are packaged: Do you gift wrap? Are your items sent in boxes? Do you include a certificate of authenticity? If you use recycled packaging write that in here too, MISI buyers love sellers who do this. Tell your buyers what shipping company you use. Can customers request faster shipping or insurance for an additional charge? If yes, ask them to contact you for more information. Give information on estimated shipping times. If you have already done a lot of shipping you will have a good idea of how long a package takes to arrive in certain parts of the world. If you have not done much shipping yet, ask at your post office, and then add a few days to their estimated times. If you ship overseas, state that customs can delay packages by up to 6 weeks, say that this does not happen often but that it can happen. It is better to forewarn your buyers about this possible problem. If you don't want to do refunds and exchanges then put it politely. Something like "I'm sorry but at this time [insert shop name here] cannot accept refunds or exchanges, please purchase seriously" comes across a lot better than "No exchanges or refunds accepted"
Good luck with your policy writing and selling your handmade items.